These rock! I see them on Highway Five south and north of Portland. They must look really sharp in snowy climates. They are unpopular here because it does not get cold enough for them to color well every winter, and we are not very interested in that sort of ‘winter’ color when so much continued to bloom here. Incidentally, Cornus stolonifera happens to be native. There used to be a few cultivars with colorful twigs, yellowish or reddish, but I have not seen them since the 1980s. They are naturally a nice shiny reddish brown. Wow, that is cool to think that you have Cornus stolonifera too. We use it for reforestation, as a native, but I do not think it is colorful as the more ornamental species. A beautiful shrub …. and birds love to hide. I cut each stem half every year but rather at the beginning of winter … I will change for March ! 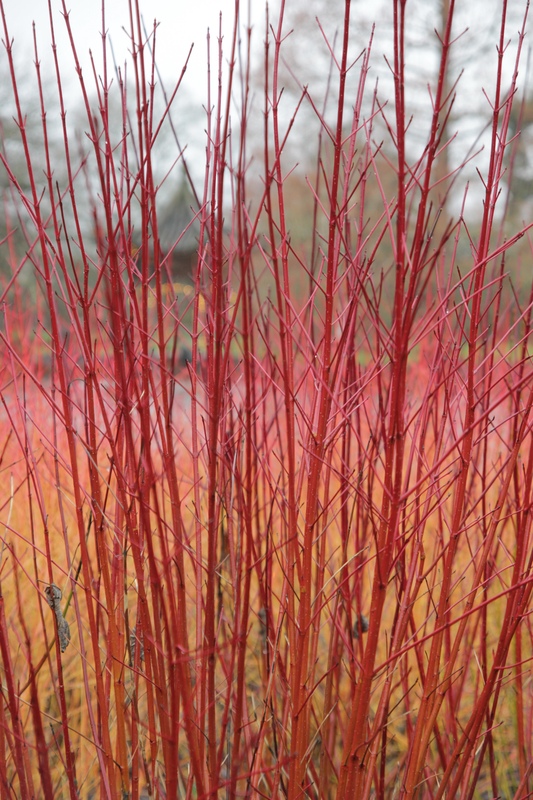 i like it a lot especially if planted with the slower growing Cornus sanguinea ‘Midwinter Fire’. So easy to propagate as well, or even layering works – great plant en masse!